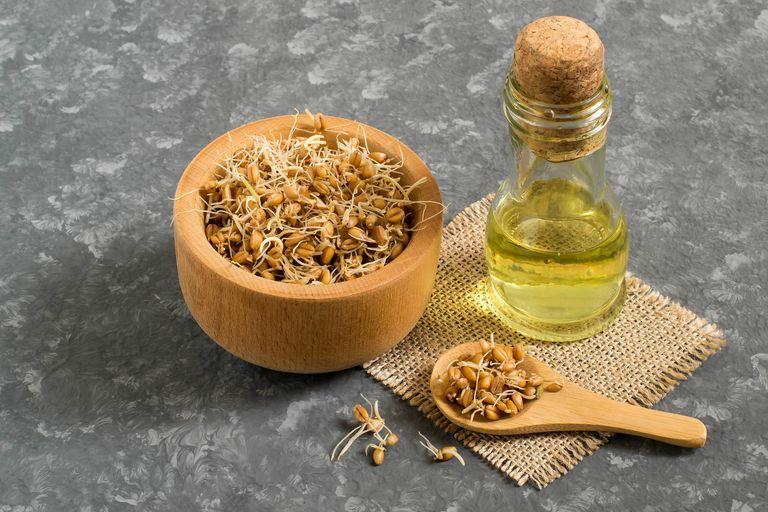 Wheat germ oil sounds like a healthy product that you should keep in your kitchen. But many consumers keep it in the bathroom. What is wheat germ oil used for? According to many sources, the oil provides beauty benefits. Fans of the products use wheat germ oil for hair and skin health. But you can also use it in the kitchen if you choose. There are no carbohydrates in wheat germ oil. That means there is no starch, no fiber, and no sugar (added or naturally occurring) in this product. Wheat germ oil has a glycemic index (GI) of zero, and if consumed, a single serving of the product also has a glycemic load of zero. That means that the food has no effect on your blood sugar levels. As a reference, foods with a GI of 55 or below are considered low glycemic foods. The fat in wheat germ oil is what makes this product popular among healthy eaters and beauty buffs. Wheat germ oil provides polyunsaturated fat, considered to be a "good" fat. Polyunsaturated fat is liquid at room temperature and may boost heart health when you use it to replace less healthy fat (like saturated fat) in your diet. There are two different kinds of polyunsaturated fatty acids (PUFAs) and wheat germ oil contains both of them. According to USDA data, you'll get 85 percent (just under 1 gram) of your daily recommended intake of α-linolenic acid (ALA) omega-3 fatty acids. And you'll get 62 percent (7 grams) of your recommended daily intake of linoleic acid or omega-6 fatty acids. You'll also get 2 grams of healthy monounsaturated fat in a single serving of wheat germ oil. You'll also get 3 grams or 12 percent of your recommended daily intake of saturated fat, a fat that is considered to be less healthy. There is no protein in wheat germ oil. However, some healthy eaters may use wheat germ oil in marinades, in protein smoothies, or in yogurt to take advantage of the healthy fat that it provides. If you consume a single serving of wheat germ oil you'll get 135 percent of your recommended daily intake of vitamin E. This vitamin is an antioxidant that may help neutralize potentially harmful free radicals in the body and provide protective benefits against certain diseases, like prostate cancer or Alzheimer's disease. However, research has provided mixed results, so health experts don't know for sure if consuming more vitamin E is beneficial. A single serving also provides a very small amount (4 percent of your recommended daily intake) of vitamin K, a vitamin that is essential for blood clotting purposes in the body. The health benefits of wheat germ oil come primarily from the healthy fat that it provides. However, it is important to remember that all fat—even healthy fat—is energy dense. That means it provides more calories per gram than carbohydrate or protein. While carbs and protein provide just four calories per gram, fat provides nine. So it is important to consume all fats in moderation if your goal is to reach or maintain a healthy weight. Beauty buffs also use wheat germ oil to combat hair loss, dandruff, dry skin, wrinkles, lice, and premature aging. To gain the benefits of this oil on the skin and hair, consumers use the product topically. That means, they massage it into the scalp or mix it into conditioners or shampoo to apply to the hair. Unfortunately, however, there is not strong support from the scientific community about the use of wheat germ oil for hair or skin. According to one research review, "After so many years of research on vitamin E, it is still unclear as to whether millions of dollars worth of vitamin E products paid for by patients and consumers have been of any benefit." What should I look for when purchasing wheat germ oil? Look for a product that has not been bleached or hydrogenated. This may not be an oil that you use very often so look for a smaller container unless you plan to use it often. How should I store wheat germ oil? Store the oil in an air-tight container in your pantry or in another cool dark place. The recommended temperature is 20-25°C or no more than 77 °F. Can I cook with wheat germ oil? Cooking or heating wheat germ oil causes it to lose its nutritional benefits. So frying with wheat germ oil is not recommended. However, you can use the oil in salad dressings, drizzle it on vegetables, pasta, or other dishes for a boost of flavor and omega-3 fatty acids. Because you won't want to cook with wheat germ oil, the uses of the product are somewhat limited. However, some people prefer to use wheat germ oil in salad dressings instead of olive oil. You can also use it as a substitute for other oils when making marinades for fish or meat. If you roast vegetables, you can drizzle wheat germ oil on your veggies after they are done cooking. And some die-hard fans of the oil even add it to smoothies. If you use wheat germ oil for beauty, simply blend a small amount into the skin or hair. Some consumers also blend the oil with other ingredients such as aloe vera or almond oil. According to the Therapeutic Research Center's Natural Medicine's database, you may experience side effects when using wheat germ oil. The source reports that if you consume wheat germ oil in supplement form (orally) the product is usually well tolerated. However, topical use of vitamin E has been associated with contact dermatitis, inflammatory reactions, and other skin reactions. Also, if you are allergic to wheat, you should avoid wheat germ oil. According to the Food Allergy Research and Education Center, symptoms of a wheat allergy reaction can range from mild, such as hives, to severe, such as anaphylaxis. Allergic reactions can be unpredictable, and even very small amounts of wheat can cause one. Berkeley Wellness. University of California. Should Anyone Take Vitamin E? January 24, 2014. Polyunsaturated Fat. PubMed Health U.S. National Library of Medicine.